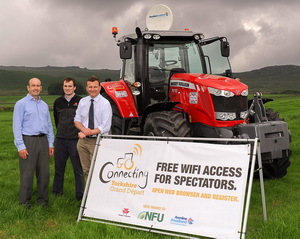 The Tour de France starts on 5th July with a 190km stage between Leeds and Harrogate and for the first two stages of the massive cycling event the NFU, Massey Ferguson and Avonline have got together to provide free Wi-Fi at four key points over the two days. "It’s obvious spectators will want to use their phones to access visitor information and post pictures, tweets and so on. As we understand how frustrating a lack of broadband in rural areas can be, we wondered if this was something we could help with. 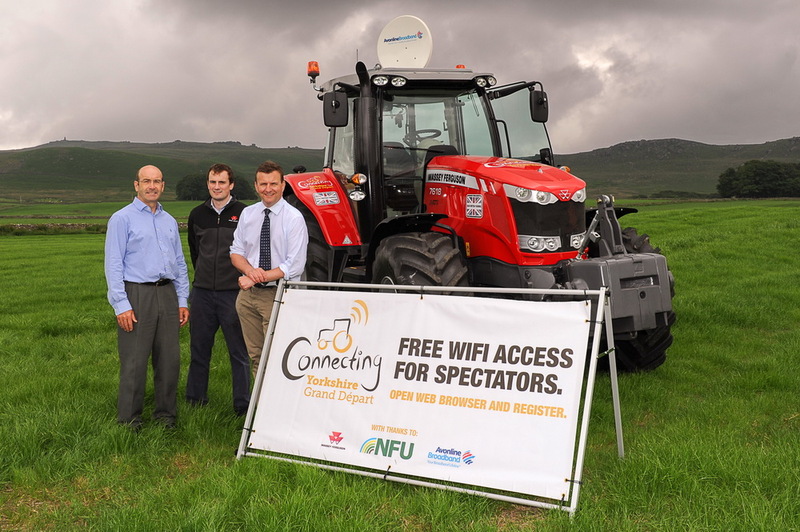 “The result is a great working partnership with Massey Ferguson and Avonline and voil´; tractors can indeed be mobile wifi hotspots!" On stage 1, one tractor will be located at the Yorkshire Dales National Park Visitor Centre in Hawes, with the second at the Visitor Centre in Grassington with the venues expecting around 8,000 people in total. For stage 2 one will be in Steel Stage event at High Bradfield near Sheffield and the other in Holme village. It will be interesting to see how the hot-spots cope, particularly once people rush to post all their pictures to twitter and Facebook just after the peloton has passed. With a claimed 500 metre radius from each vehicle we presume that something a lot better than the standard Wi-Fi antenna is being used. At 500m it would have to be an incredibly sensitive receiver as well as phones will not be pumping out signals at high power - surely the phone wifi signal for sending would have attenuated beyond anything useful over that distance? The link is based on a Tooway Satellite connection (as can be seen by the type of sat dish). Soon people will realise what impact latency has on a satellite link, and how congested Tooway has become, a victim of its own success since they started. Good idea, yes. Really useful? Not so sure. Latency I don't mind. What I dislike is the reduction in speed down to near as bad as BT used to manage. Oh tes and having been given an IP address that puts me outside the UK for some reason.No real choice makes for an unhappy partnership. Useless service is also a bind, 9 till five monday to friday, faults only occur friday evening.